Obama's Libya Decision Could Undo GOP Spending Cuts : It's All Politics President Obama's decision to deploy U.S. military assets against Libyan dictator Moammar Gadhafi is costing more than $100 million a day at a time when the focus has been on spending cuts. You hate to seem like too much of bean counter when saving innocent civilian lives from a brutal dictator is the goal. 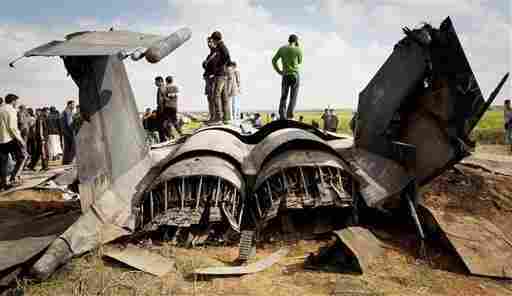 But the loss Tuesday of a U.S. F-15 fighter jet in Libya from an apparent mechanical problem (fortunately the crew ejected and was rescued) just underscores the financial expense of the U.S. effort in the North African nation, a cost now being questioned. While it's difficult to get an exact cost for the aircraft, GlobalSecurity.org puts the unit cost for an Air Force version of the F-15, which is a fairly old aircraft design dating back to the 1970s, at $55 million. According to The Hill, U.S. military's activities over Libya are costing perhaps more than $100 million a day even without lost aircraft. And the news outlet further notes that if U.S. participation at the current operational tempo goes on long enough, a lot of the "savings" from Republican-driven spending cuts could be undone. In separate briefings on Monday, the Defense Department and the White House said they do not yet have a projected price tag for the military action that began on Saturday. Defense officials said they are still "collecting" and analyzing early costs. With the Arab League already having second thoughts, and Turkey nixing NATO taking over, today there are even more questions. We also have to debate how all this effects the Saudis, Bahrain and Yemen." Keep in mind Lugar is one of the Senate Republicans most friendly to Obama. Obama's first foreign trip as a senator was with Lugar when they traveled to the former Soviet bloc to inspect nuclear disarmament efforts there. Lugar, the senior Republican on the Senate Foreign Relations Committee, has long been one of the Senate's top foreign-policy experts. Lugar's faces a 2012 primary challenge from the Tea Party so that must be kept in mind. Still, if Lugar is talking bringing up the budget impact of the president's Libya decision, the issue is already joined.